Good how to article. However, if I know I can't finish a bottle in one day, I would just decant enough for same-day consumption and leave the rest in the bottle thereby not exposing the wine to too much oxygen. Thanks for another great how-to article for all of the newbies. 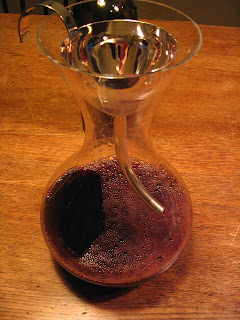 I've tried decanting a little and your article helps me know more about what's going on and how I can improve the process. I like the difference decanting makes in a red wine. It's interesting to make tasting notes before and after decanting. great post. but I wonder about the funnel aspect. As a former homebrewer of beer, I know we used funnels, tubes, and the like in order to keep oxygen OUT of the beer before fermentation. The same is true when you pour a pint from a bottle or tap -- let it run down the side gently so not much oxygen gets in. Thanks for the great comments. TasterB, a good rinse with hot water after the decanter is empty and before the residue glues itself to the decanter is one way to go, but there are specialty brushes, too, for more stubborn spots. I see what you mean, Rouge and Blanc, but I figure, hey, get the whole wine decanted, then preserve it over night. Saves cleaning the decanter twice. BF, I think the difference here is the "too much" qualification. What qualifies as just the right amount of oxygen for bubbly beer it seems is just the right amount for still wine, too. "Splash decanting" adds more oxygen quickly, but most prefer the gentle method, which (as the foam shows) does add oxygen--it's just a bit easier to control. Very Interesting tips. 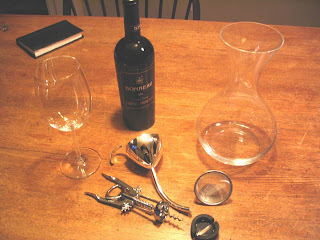 I have seen decanting done before, but have never tried it myself; I will be trying it with one of my next bottles. Thanks for the good info. great pics! Led me through the article very nicely. Excellent article. Can you help me with a question? 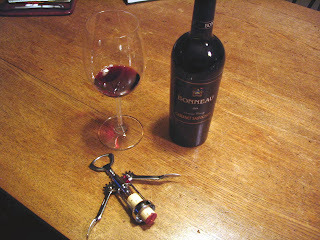 I have about 2 cases of reds from Italy, which are quiet young and decanting will really help. 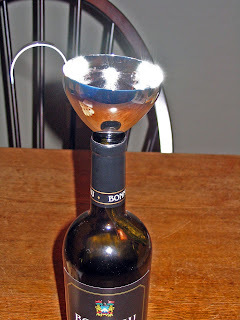 I was wondering if I can decant and let the wine breath for 15-20 mins, and put it back in a bottle and re-cork it with new corks and store it my cellar. 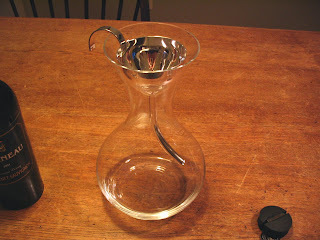 This way, I will have wine to drink when I want to without decanting everytime. Will this cause any problem in degrading the wine for storage? Thanks!